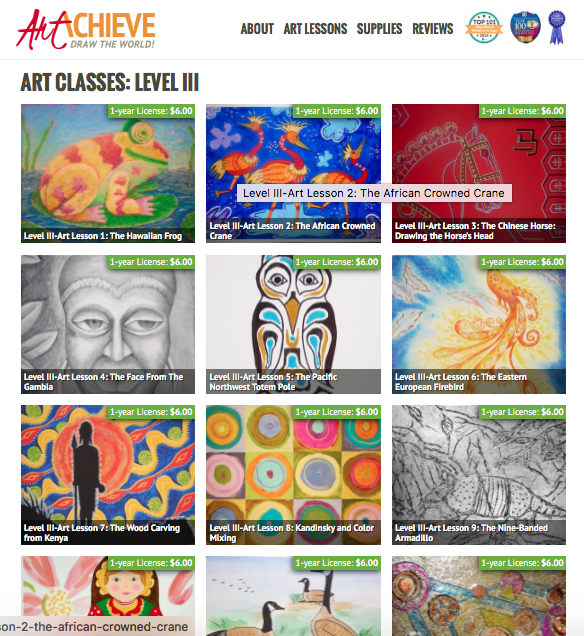 ArtAchieve provides unique online art lessons inspired from art around the world. 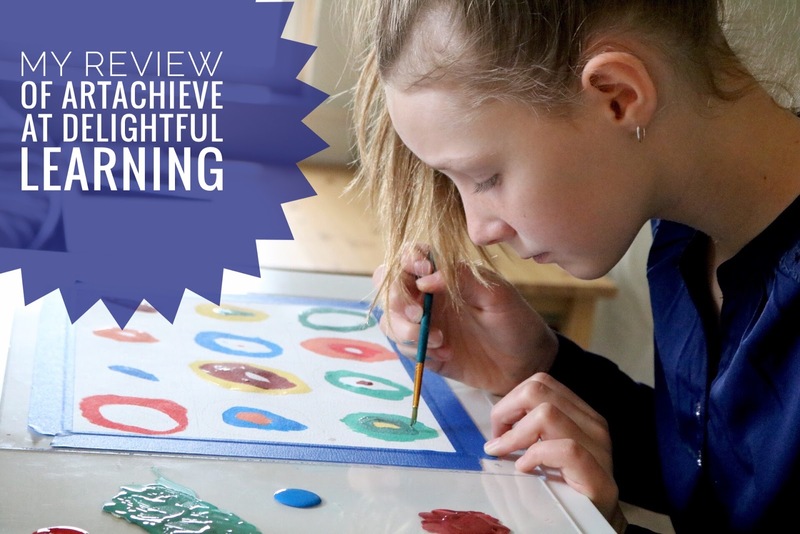 The lessons, which are available in five different levels for a variety of ages and skill, are designed to help students achieve success and make cross curricular connections with art. 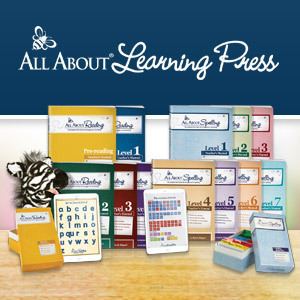 The lessons are available individually, but the Entire Level III is bundled together for $58.50 for a one year license. Level III is designed for ages 9 and up, so I chose to use this with my 10 year old daughter, Eliana. I'm happy to say that we had a wonderful experience, and I'm excited to share about it! How did we use Level III? I had Eliana watch the video on the iPad, and I followed along with the PowerPoint on my computer. The video itself is about 32 minutes long, and the PowerPoint contains 52 slides that match the content on the video. The slides weren't exactly in the same order as the video, but it was easy to find the slides for each part of the lesson. This lesson is inspired by Kandinsky's abstract painting "Farbstudie Quadrate" also called "Concentric Circles" in which he famously painted layered circles within squares. Wassily Kandinsky was a Russian painter who highly influenced modern abstract art. Did you know that Kandinsky painted music? He believed that he was able to hear colors and see sounds. He said his paint sang, and he gave his paintings titles like "Composition" and "Contrasting Sounds." Media for this lesson include pencil and acrylic. To mix colors to create our own version of the famous painting. Time to complete: 35 minutes for Color Mixing and 60 minutes to Paint the Picture. Lesson 8 began with a warm up exercise to learn how to mix colors. We learned about primary and secondary colors, how to make shades and tints of colors, and what it means when a color has value. We did "experiments" to show how one color can overpower another and what happens when we mix more of one color than another. The lesson included a guide for mixing colors. This was really helpful visual that showed how colors are arranged in order of value and how to add color based on value. We drew a grid with concentric circles inside. She did not want to freehand draw the circles. I told her that Kandinsky's circles were not perfect circles, and that's what makes them unique. Then we followed the lesson to paint the circles, first using primary colors, then secondary colors, then shades, then tints before finally filling in the squares to finish our painting. Her version of Kandinsky's Farbstudie Quadrate! We played music in the background while painting, and it was a peaceful and enjoyable time. While Artist John Hofland encourages us to only play instrumental music, and we did listen to the sample of the album he recommended, I chose another selection to play. The music we played did have words, but it was peaceful music. Though, at times the music was energetic and I could feel that energy while I painted. It was a really neat experience! I enjoyed the process so much that that I made a video to share. In fact, I'm planning to do this project again. I have a 15x20 illustration board and thought it would be special to have each child plan and paint 4 squares of their choosing and hang it on the wall in our schoolroom. At the end of each lesson is a reflection time and an artist's challenge. For example, it asks the question, "When you mixed the tints or shades, did any of the new colors surprise you?" Yes, some of the colors were pretty, but some were ugly, so we had to practice mixing to get the colors we liked. Purple was really hard to mix, and I wasn't happy with any results, but it surprised me that it was hard to get a pretty and bright shade of orange. Another question was "Which colors looked the most exciting when placed side by side?" We thought bright colors next to light colors looked the most exciting. Kandinsky lived in Russia before and after the Communist Revolution, in Germany while the Nazi's rose to power, and in France during World War II, so his art is influenced by French Impressionism, which included artists like Claude Monet or Edgar Degas, Russian Constructivism, which was a rejection of independent art by Vladimir Tatlin who wanted to "construct" art, and the German Bauhaus Movement, which combined crafts and the fine arts. These are suggested topics of study for Art along with Kandinsky's theory of color. His theory of color is interesting. For example, clarity was white and symbolized possibility, while obscurity was black and symbolized "nothingness without possibility." Many Cross Curricular Connections can be made when studying the art of Kandinsky, such as a study of World War II and The Russian Revolution for Social Studies. One suggestion was to watch the movie The Hiding Place. 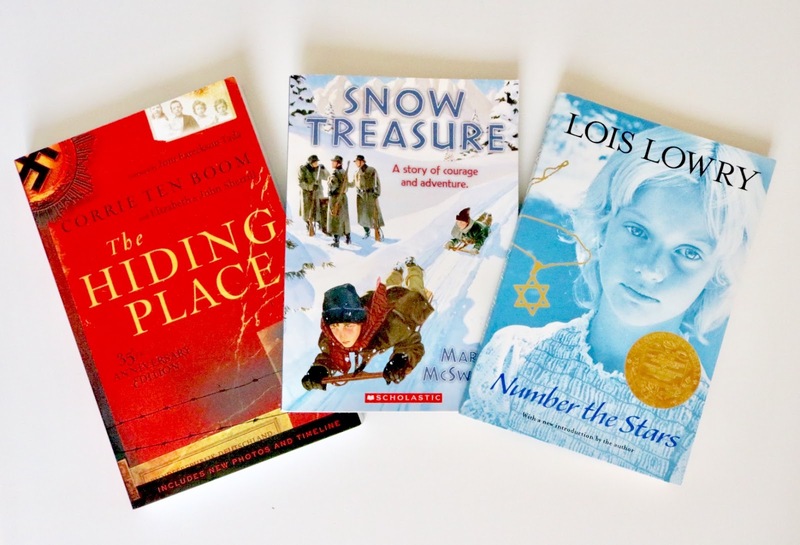 Book suggestions for Language Arts included The Diary of a Young Girl, by Anne Frank, Snow Treasure, by Marie McSwigan, The Boy in Striped Pajamas, by John Boyne, and Number the Stars, by Lois Lowry. I found several of these in our home library in addition to a few that would go along as well, such as Escape from Warsaw, by Ian Serraillier and I am David, by Anne Holm. For Geography, it is suggested to find pictures to study the the colors and shapes of the houses and churches in Vologda, Russia to see what may have inspired Kandinsky. There are 13 lessons in all. I really like that you can purchase each art project separately, and that they are very affordable. In addition to pencil and acrylic, other media in Level III includes oil pastels, fine tipped black magic marker, drawing pencils, colored markers, water colors, glue, and even shoe polish! In the reflection time at the end of The Matryoshka lesson, you are encouraged to rest and listen to a Russian good night song. :) Then there is a prompt to reflect on your own painting by answering questions such as "where is the most detail on your picture?" and then a prompt to find the most detail on the original. One artist's challenge included painting wooden Matryoshka dolls. ArtAchieve art lessons are really well done. Artist John Hofland believes that any child can learn to draw and encourages students to take artistic license and enjoy freedom of expression in their art. I love how thought provoking and creative the lessons are. 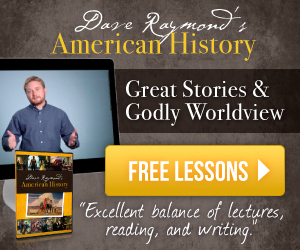 The site is easy to navigate, the lessons are detailed and easy to follow, and the Cross Cultural Connections are great for enriching your studies. I've learned so much that I didn't know before, and it excites me that I can learn so much about the world through art. We reviewed art achieve last year, and I totally forgot about it! I need to purchase a few classes for us to watch! I'm worried I'll forget too, so I'm glad you said something. I need to add Art to our weekly schedule so I don't forget. You mentioned that you didn't know what Farbstudie meant in English, so let me introduce you to Google translate (https://translate.google.com)! 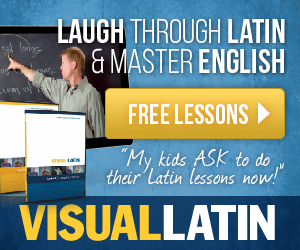 It's a great way to learn new foreign words. In this case "farbstudie" translates to "color study" on Google Translate. 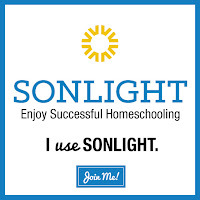 Thanks for your enthusiastic review! Thank you, Mr. Hofland! I never thought to check google translate, I just googled it! I love the name even more now! Very much looking forward to trying more of your art projects now that school is starting up again! Thanks so much for the opportunity!